The motto of Rambam Mesivta’s extracurricular activities program is “A Team for Every Talent. A Club for Every Curiosity. A Place for Every Person.” In addition to all the sports teams, basketball, hockey, flag football, etc., and all the academic teams, mock trial, Model UN, Debate, and more, Rambam features a “Contest of the Month” that creates opportunities for every student in the school to get involved in something that speaks to his particular skillset and strengths. Before the break, sophomore Benny Herskowitz initiated a schoolwide Bananagrams Tournament to help raise funds for tzedakah. 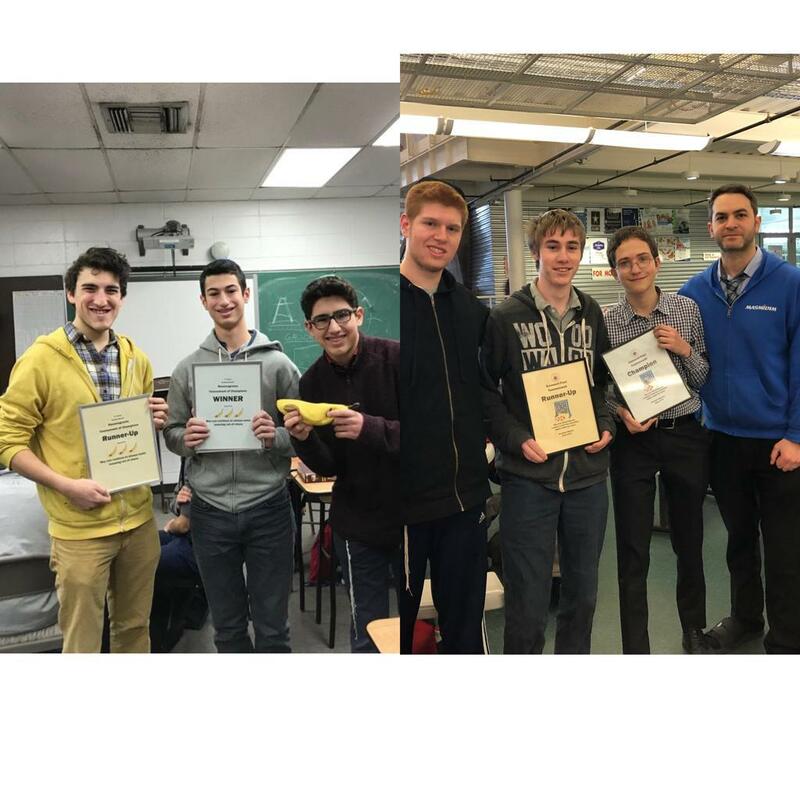 Oren Teeter, a senior, put up a great fight against junior Abie Hersh but Abie, in a best-of-three championship, took home the coveted Bananagrams Plaque. This tournament was hot on the heels of the tzedakah Connect-Four Tournament spearheaded by 10th-grader Yakov Farrell, which saw Yakov take home the prize in the finals against junior Aaron Weiss. There was a Carcassonne Board Game Tournament earlier in the year, as well as the schoolwide 4-Corner Dodgeball Tournament. All tournaments are student-centered and student-run, providing the students with opportunities to engage in leadership roles. All contests also feature either a chesed element or tzedakah component. The school also had a writing contest as well as a Visual Puzzles Challenge contest. This was in addition to the sports contests held at the Shabbaton including a schoolwide flag-football tournament, the JV Cup, and a ninth-grade Homerun Derby. Coming up in February is the schoolwide 3-on-3 Basketball Tournament, February Madness, as well as the annual LSAT Challenge. Something for everyone, with everyone involved, and everyone thinking of how they can help others: Rambam. Rambam Mesivta has many extra learning opportunities for its talmidim. In addition to the voluntary learning that takes place before davening every morning, Rambam rebbeim provide learning opportunities during lunchtime and evenings after school through the school’s Masmidim Extra Learning Program. Approximately 35 talmidim participate in this extra learning program and enjoy the opportunity to do voluntary learning in a myriad of interesting topics. The Masmidim are treated to a special annual luncheon at Traditions restaurant with a guest shiur. The group then goes on a trip to cement their kesher. Past trips have included Escape the Room, Air Trampoline, and VRWorld, just to name a few. The Masmidim are also outfitted with exclusive Masmidim gear. 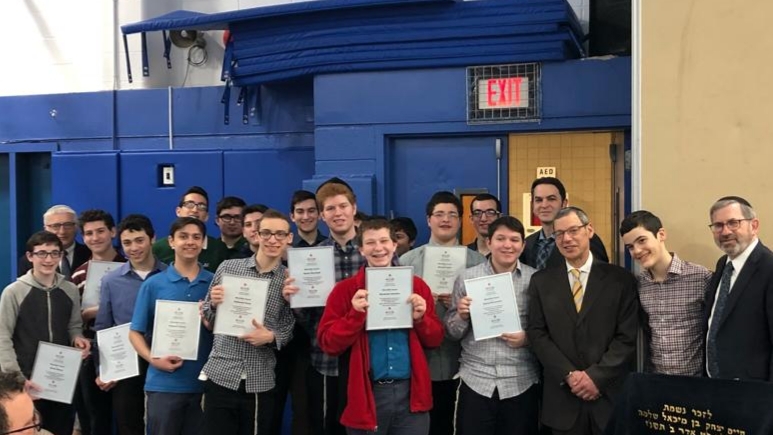 At this year’s annual Father–Son Learn-A-Thon, tribute was paid to the Masmidim by Rabbi Zev Meir Friedman, rosh mesivta of Rambam, who spoke glowingly about the program, the rebbeim, and the boys that participate. Each talmid was called up and presented with a Masmidim plaque of honor in front of their respective fathers and grandfathers and the 250 people assembled.